If you want a river with plenty of small rapids, steep gorges, clear water, quiet campsites and plenty of fun then this is the trip. Clients rate this river over most others. There is clear water for trout fishing and swimming, grassy campsites on the river's edge, high papa bluffs, stands of native bush, short walks to waterfalls and the amazing "Rangitikei Boulders". We also walk to the remains of the Mangaweka power scheme — Built in 1911 Mangaweka was one of the first towns on the main trunk line to have its own power. The three day trip takes in the end of the upper gorge of this part of the river - lots of small rapids. The first day has some of the best scenery on the river and a rapid every 50m or so. The river gets easier the further down we get. If you've done the Whanganui, or some paddling before then we know that this trip wont disappoint you. 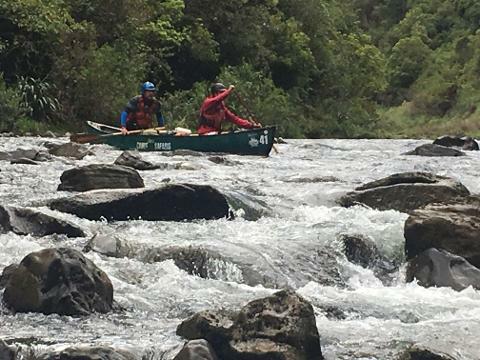 We've had overseas guests who rate the Rangitikei over many other rivers that they have paddled.